mothers and daughters – Amy Lyles Wilson, M.A., M.T.S. The return address was my niece’s, so I assumed my precious three-year-old great nephew had sent me a card. Upon opening the envelope, I found a folded-over piece of green paper, with a thickness between typing and construction paper. Although I did not recognize the writing on the front, upon turning the page I quickly knew my mother’s penmanship, that familiar cursive that has seen me through sleep-away camp, moves to Knoxville, Washington, and Nashville, the death of my father. A little weaker looking now, but still full of heart. I’ve been crying a lot lately. A sister tells me it’s because I’m in my fifties that everything has suddenly taken on an increased tenderness. She says one day I’ll wake up and everything will be all right, but that it might take a while. She’s just past sixty and doing great, so if she says it gets better, I choose to trust her. In my current condition, a teenager waiting at the bus stop, who looks like maybe she had to work a shift after school, still in her fast-food uniform at night, makes me cry. The bearded man whose truck stalled next to me at a traffic light makes me cry. He tried to crank the engine four times before sliding slightly into the intersection. The truck looked like it had been pieced together with scraps, a patchwork of parts, and in that short span of time I convinced myself the man was down on his luck and all alone in the world. Please let it start. Please let it start. Please let it start. Please let it start. And it did, just after the light turned green and before anybody started honking. We both went on our way, me thanking the universe and driving straight down Woodmont, him puffing on his cigarette, changing lanes as he turned onto Hillsboro. I’ve always been sensitive, mind you, but it’s more pronounced now. 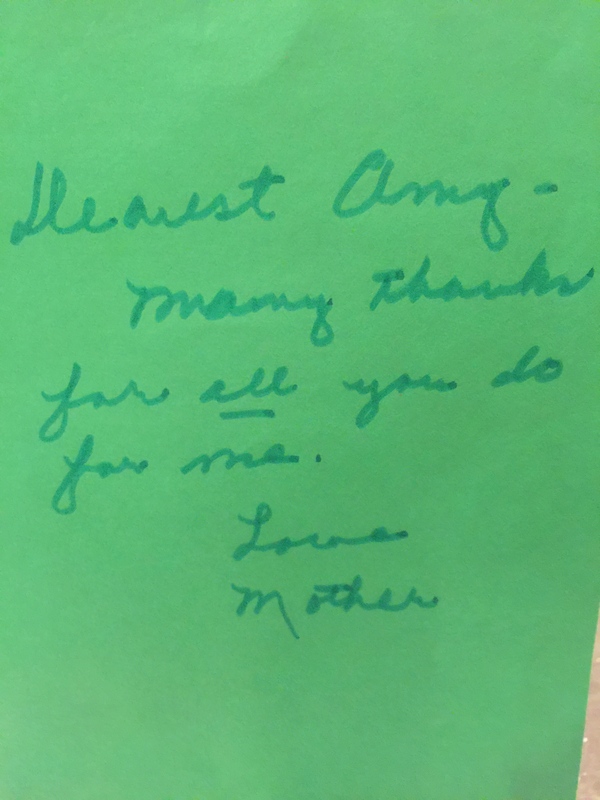 When I realized my ninety-two-year-old mother had made me the card, and not a toddler, the tears came fast and fell for what seemed like a full minute. 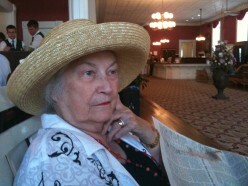 Mother was diagnosed with dementia two years ago, and she lives in a residential facility for people with memory issues. My family’s Christmases are not the same as in the days of yore. Daddy’s been dead for fourteen years, and the rest of us can’t always gather together during the holidays. Chances are slim you’ll find us on Facebook in matching outfits holding mugs of steaming cocoa in front of a garland-draped fireplace. We are wandering a new land now, full of misplaced memories and far-flung relations. There was a time not so long ago that imagining my mother sitting around a table with other aging, confused souls during “craft time,” putting stickers on colored paper while singing Christmas carols off key, might have made me blush with embarrassment, or shame, or pity. Who knows? Now I consider it a blessing. 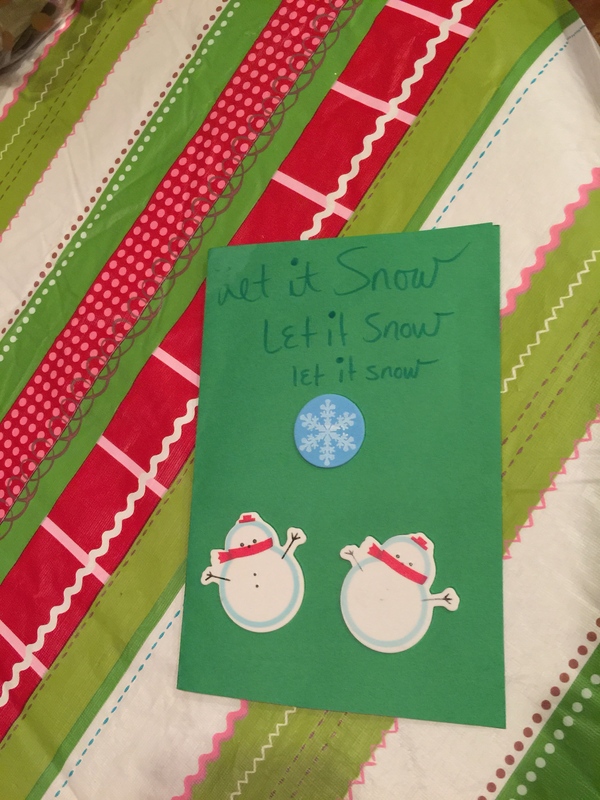 I will treasure this green piece of paper with the snowman stickers and the slanting salutation, for it is what my mother can give. She offers what she has left of herself to me and I stand ready to receive. May we all give what we can, whatever it might be, for as long as we can.